Don't you know what's goin' on out there? This is no Sunday School picnic! 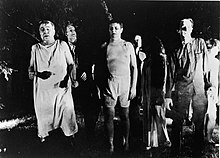 Night of the Living Dead is a 1968 black-and-white horror film about a group of people hiding from bloodthirsty zombies in a farmhouse. Directed by George A. Romero. Written by John A. Russo and George A. Romero. Now get the hell down in the cellar. You can be the boss down there, I'm boss up here! You know a place back down the road called Beekman's? Beekman's Diner? Anyhow, that's where I found that truck I have out there. There's a radio in the truck. I jumped in to listen, when a big gasoline truck came screaming right across the road! There must've been ten, fifteen of those things chasing after it, grabbing and holding on. Now, I didn't see them at first. I could just see that the truck was moving in a funny way. Those things were catching up to it. Truck went right across the road. I slammed on my brakes to keep from hitting it myself. It went right through the guard rail! I guess - guess the driver must've cut off the road into that gas station by Beekman's Diner. It went right through the billboard, ripped over a gas pump, and never stopped moving! By now it was like a moving bonfire! Didn't know if the truck was going to explode or what. I still hear the man... screaming. These things, just backing away from it! I looked back at the diner to see if - if there was anyone there who could help me. That's when I noticed that the entire place had been encircled. There wasn't a sign of life left, except... by now, there were no more screams. I realized that I was alone, with fifty or sixty of those things just... standing there, staring at me! I started to drive, I - I just plowed right through them! They didn't move! They didn't run, or... they just stood there, staring at me! I just wanted to crush them! And they scattered through the air, like bugs. Because of the obvious threat to untold numbers of citizens, and because of the crisis which is even now developing, this radio station will remain on the air, day and night. This station and hundreds of other radio and TV stations throughout this part of the country are pooling their resources through an emergency network hookup to keep you informed of all developments. At this hour, we repeat, these are the facts as we know them. There is an epidemic of mass murder being committed by a virtual army of unidentified assassins. The murders are taking place in villages, cities, rural homes and suburbs with no apparent pattern or reason for the slayings. It seems to be a sudden, general explosion of mass homicide. We have some descriptions of the assassins. Eyewitnesses say they are ordinary looking people. Some say they appear to be in a kind of trance. So, at this point there is no really authentic way for us to say who or what to look for and guard yourself against. In all parts of the country, the wave of murder which is sweeping the eastern third of the nation is being committed by creatures who feast upon the flesh of their victims. First eyewitness accounts of this grisly development came from people who were understandably frightened and almost incoherent. Officials and newsmen at first discounted those eyewitness descriptions as being beyond belief. However, the reports persisted. Medical examinations of some of the victims bore out the fact that they had been partially devoured. I think we have some late word just arriving and we interrupt to bring this to you. This is the latest disclosure in a report from National civil defense headquarters in Washington. It has been established that persons who have recently died have been returning to life and committing acts of murder. A widespread investigation of reports from funeral homes, morgues & hospitals has concluded that the unburied dead are coming back to life and seeking human victims. It's hard for us here to believe what we're reporting to you, but it does seem to be a fact. All law enforcement agencies and the military have been organized to search out and destroy the marauding ghouls. The survival command center at the Pentagon has disclosed that a ghoul can be killed by a shot in the head or a heavy blow to the skull. Officials are quoted as explaining that since the brain of a ghoul has been activated by the radiation, the plan is, kill the brain and you kill the ghoul. Johnny: Do you remember one time when we were small, we were out here? It was from right over there, I jumped out at you from behind the tree, and Grandpa got all excited, shook his fist at me and said "Boy, you'll be damned to hell!" [laughs] Remember that? Right over there. Boy, you used to really be scared here. Johnny: Hey, you're still afraid, aren't ya? Barbara: Stop it, now! I mean it! Johnny: [in a creepy voice] They're coming to get you, Barbara! Barbara: Stop it! You're ignorant! Johnny: They're coming for you, Barbara! Johnny: They're coming for you! Johnny: Here he comes now! I'm getting out of here! Ben: How long have guys you been down there? I could have used some help up here! Harry: That's the cellar. It's the safest place. Ben: You mean you didn't hear the racket I was making up here? Harry: How were we supposed to know what was going on? Could have been those things for all we knew! Ben: That girl was screaming. Surely you know what a girl screaming sounds like. Those things don't make any noise. Anybody would know somebody needed help! Tom: Look, it's kind of hard to know what's going on from down there. Harry: We thought we could hear screams, but for all we knew, that have meant those things were in the house after her. Ben: And you wouldn't come up here and help? Harry: That racket sounded like the place was being ripped apart. How were we supposed to know what was going on? Ben: Now wait a minute. You just got finished saying you couldn't hear anything down there. Now you say it sounded like the place was being ripped apart. It would be nice if you get your story straight, man. Harry: All right, now you tell me! I'm not gonna take that kind of a chance when we've got a safe place! We lock into a safe place, and you're telling us we gotta risk our lives just because somebody might need help, huh? Ben: [disgusted] Yeah, something like that. Ben: I'm telling you they can't get IN here! Harry: And I'm telling you they turned over our car! We were damn lucky to get away at all! Now you're telling me these things can't get through a lousy pile of wood? Harry: Did you hear me when I told you they turned over our car? Ben: Oh, hell! Any good five men could do that! Harry: That's my point! There's not going to be five, or even ten! There's going to be twenty, thirty, maybe a hundred of those things, and as soon as they find out we're here, this place'll be crawling with them! Ben: Well, if there's that much, they'll probably get us wherever we are. Harry: Look! You two can do whatever you like! I'm going back down to the cellar, and you'd better decide! 'Cause I'm gonna board up that door, and I'm not going to unlock it again no matter what happens! Tom: Now wait a minute, Mr. Cooper. Harry: No, I'm not going to wait! I've made my decision, now you make yours! Tom: Now wait a minute! Let's think about this! We can make it to the cellar if we have to! And if we do decide to stay down there, we'll need some things from up here! So let's at least consider this a while! Field reporter: Chief, if I were surrounded by six or eight of these things, would I stand a chance with them? Chief McClellan: Well, there's no problem. If you had a gun, shoot 'em in the head. That's a sure way to kill 'em. If you don't, get yourself a club or a torch. Beat 'em or burn 'em. They go up pretty easy. Field reporter: Well, Chief McClellan, how long do you think it'll take until you get the situation under control? Chief McClellan: Well, that's pretty hard to say. We don't know how many of 'em there are. We know when we find 'em, we can kill 'em. Chief McClellan: Yeah, they're dead. They're all messed up. Sheriff McClelland: Aim between the eyes. Sheriff McClelland: Good shot! OK, he's dead; let's go get 'im. That's another one for the fire. Pits the dead against the living in a struggle for survival! They're coming to get you...again! ↑ This has been described as George Kosana's most memorable line from the film. It was originally an ab lib from Kosana's audition for the role. Source: Whack, Errin Haines (3 January 2017). "George Kosana, sheriff in 'Night of the Living Dead,' dies". Associated Press. Night of the Living Dead Download — Both HD (Blue Ray) and standard version available for free. This page was last edited on 5 March 2019, at 14:44.